This is one of my favorite straight up chocolate cookies. They are pretty incredible, and incredibly easy to make. This cookie is really just a small amount of chocolate cookie dough holding together a collection of chocolate chips and chunks. Seriously. Only 1 3/4 cups of flour to make three dozen cookies. The texture is sort of a cross between a brownie and a cookie. So good. You can add any combination of chocolate chip or chunk combinations. For these cookies, I used 9 ounces of 47% semisweet chocolate chunks and 3 ounces of white chocolate chunks. I've also made them with half semisweet chocolate chips and half white chocolate chunks. I'm thinking that cinnamon, butterscotch, or mocha chips combined with chocolate chunks would be wonderful as well. I also like to pair these cookies with Vanilla and Chocolate Rocks for a nice contrast. Chocolate and vanilla. Killer. I'll have three of each please. Thank you. Line three half sheet pans or cookie sheets with parchment paper. In the bowl of a stand mixer or a medium bowl, mix the butter, brown sugar, baking powder, espresso, and salt. Beat in the eggs and and vanilla until the mixture is smooth. Mix in the flour and cocoa on low until blended. Stir in the chips/chunks by hand. Using a spoon or a tablespoon cookie scoop, form the dough into 1 1/2 inch balls and place them on the parchment. Bake for 8 to 10 minutes, one sheet at a time, and cool on the baking sheets. Enjoy! You will be very popular. 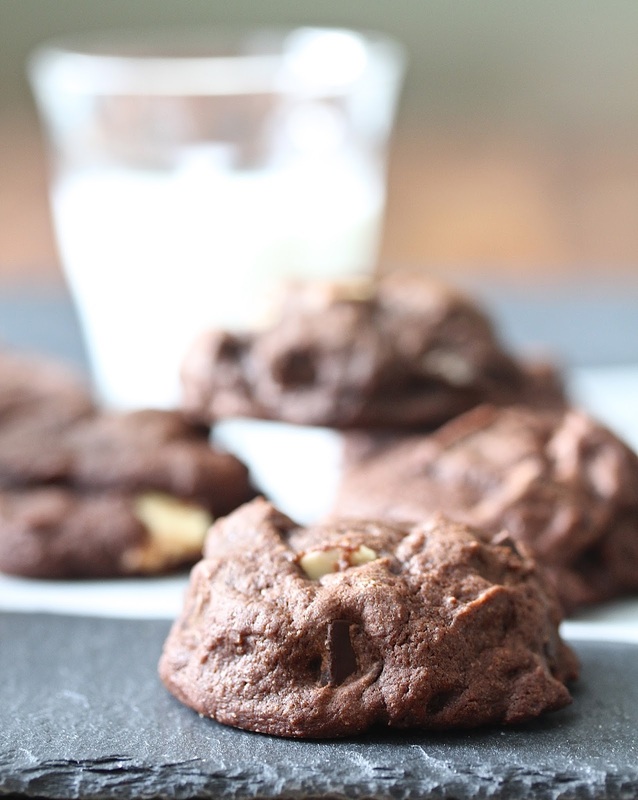 Can´t go wrong with double chocolate in a cookie! Nice tip about the coffee powder. They look wonderful! Thanks Paula. I was getting really frustrated by my espresso powder clumping! Just saw your link over at That Skinny Chick Can Bake's link party and thought I'd come over and check out the recipe. Wow. 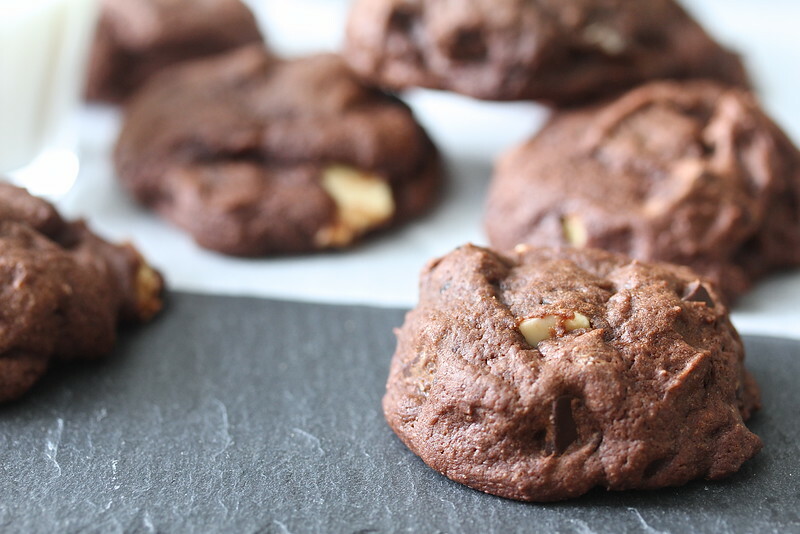 Double chocolate chunks...and espresso... this could be the best cookie ever! Thanks Tony! They are really good. I took them to work today and they were gone in a flash. I finally made it to see your focaccia, which looks really good, and found this post which is just what I need right now. Right now a chocolate cookie would make me soooooo happy and yours look yummy! These late night get-the-taxes done chores never end but taking a break now and then for some great food keeps me going. All this food blogging and my blogging friends bring a welcome fun change of pace to my busy schedule. Love seeing your blog. Yum these cookies look lovely, I would love to have a few of those right now! These look totally irresistible, Karen!!! This looks so delicious, I totally want one now! They are really good, TZ. Thanks! I love pairing chocolate and coffee! wonderful cookies Karren, great idea to use chocolate chunks also for a different texture. Thank you Roxana! Thank you for hosting it. Thanks for sharing your link at my weekend link party last week @The Weekend re-Treat! You were one of my featured links from last weekend! Hope to see you again this week! Thanks Becca. They are chocolate on chocolate. One of my favorites. Chocolate cookies are one of my absolute favourite to make. These looks perfect. I love your description of them being a cross between a brownie and a cookie. Awesome! My cookie monsters at home including would love these! Yum!